A child development specialist once explained to me that one of the early differences between boys and girls is that boys create play centered around fighting villains and conquering evil, while girls create play around conquering chaos in the home. In the girl’s mind, a disorganized mess in the house was the equivalent of a bad guy invasion to the boys. Not to belittle the fantasies for boys or little girls, but honestly, is there anything more nightmarish than complete and utter chaos at home? Or worse, that you can’t wield it under control? Goldilocks and the Three Bears is a perfect example: Look how upset mama bear gets when she discovers room after room in disarray. 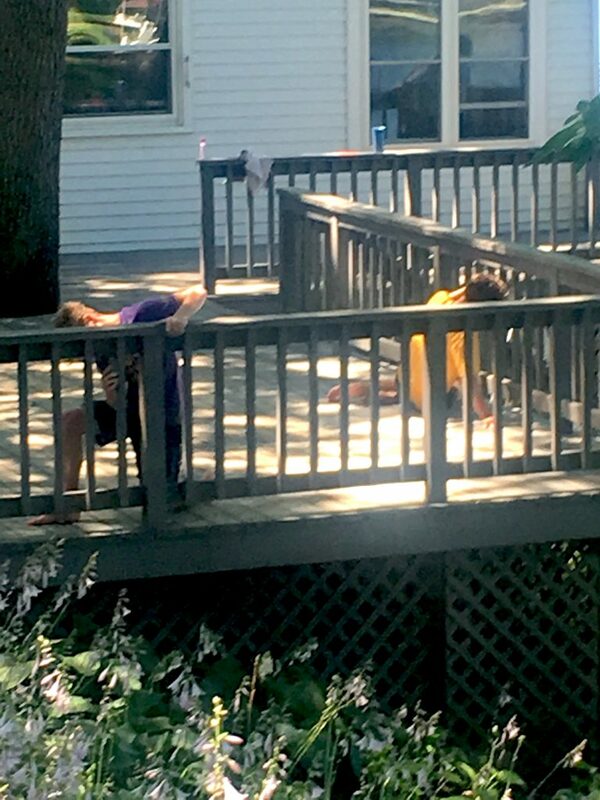 It was time to stain the deck… again. This is a mammoth job — and there is no mercy to be found. There are no shortcuts, and cleaning, power-washing, cleaning again, getting stuck acorns stuck between the boards, and hand-brushing the stain (all 9 gallons — that’s how much square footage there is to cover) and 250 rails, is back-breaking, tedious work. 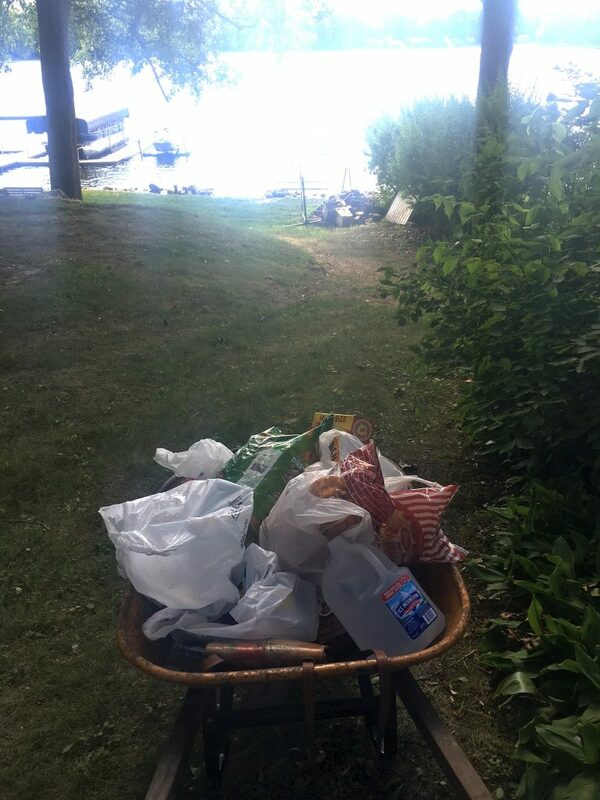 Once I returned, with my trunkload full of rations, I realized that with the deck wet, I had no way to carry the groceries into the house, without walking down the hill, and going into the basement and then walking back upstairs to the kitchen. And all of my “helpers” had paintbrushes in their hands. Ingeniously, I loaded the wheelbarrow with the groceries and wheeled them to the top of the hill, where I very gingerly made it all the way to the bottom without tipping or breaking the eggs. Once all the food was packed into the fridge and pantry…I realized that the fridge, or freezer, was not cold. I remained in denial for a few more minutes — believing that after the door had been left open for so long, it needed time to cool down. But, that rationalization did little to explain the fact that the ice cube trays were holding puddles of water. This acceptance started a chain reaction that involved filling the coolers with ice from the neighbor’s ice machine, pushing refrigerated food through the tiny kitchen window (doorway still covered in a wet slick of oil-based stain) in the back of the house, where it could be transported to a cooler, or to the guest-house refrigerator that was already stuffed from the numerous guests who had left, and was already prepared for the guests who were coming. The best part of the story is, after calling every appliance store in the area, that there is no refrigerator within 20 miles that can fit into the special space constraints of our kitchen, which briefly started a hair-raising discussion of remodeling the kitchen, (a Goldilocks nightmare). So, we called our handyman, who was able to re-start the refrigerator by adjusting the relay switch for around $100.